Josh and Marc were away over the weekend and there was a bit of cattle work to be done so Jeff enlisted my help, a change of activity for me and a leap of faith for him! To clarify that statement; it’s some time since my services have been required to do any mustering or drafting. That doesn’t mean I’ve been made redundant or my skill-set has become obsolete, rather it’s the joy of having the two boys at home working alongside Jeff that has afforded me some semi-retirement time from “front line activities” and also given me more time to concentrate on my role as President of CWA of NSW. That’s not to say I didn’t enjoy the fresh air, open spaces, change of pace, different scenery, sunshine, exercise, solitude, the company of critters, a fantastic sunset and working with Jeff. In fact it reminded me how much I had missed poking around in the “fully loaded Gauntlet Runner” (see blog post here ‘How Hungry Are You?’) behind some of our beautiful cattle enjoying the company of Gemma; elevated to first class on the passenger seat, Marv and Sarge travelling business class in the back and Chip (by choice) in economy with his head out the door. The mud on the seat is courtesy of Gemma and Marv who thought it a good idea to get IN the trough to drink!! 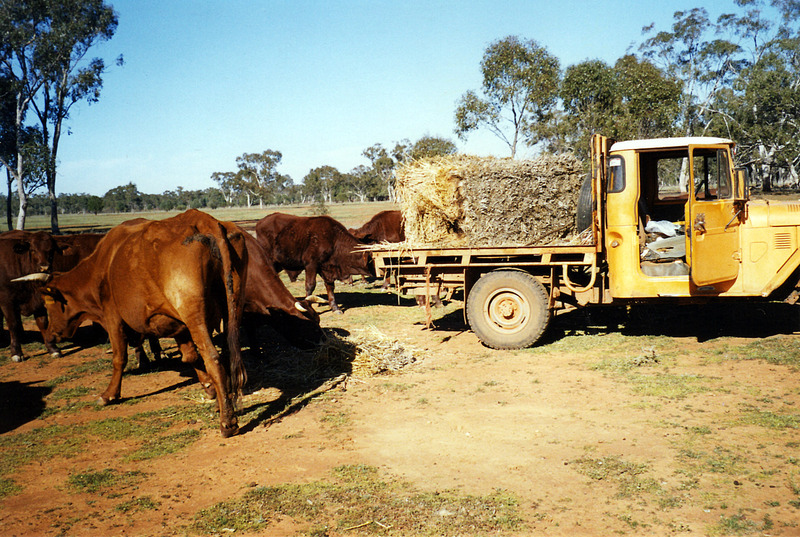 Mustering and drafting with Jeff, although enjoyable, presents its challenges (as any grazier’s wife will attest) and mind reading must factor high in the female partners’ list of talents. Love you darling! Whilst meandering about the paddock I reflected on the fact that once upon a time we would have been mustering and drafting a couple of hundred heifers with the intention of culling and selling only half of them and keeping the rest to augment our herd. 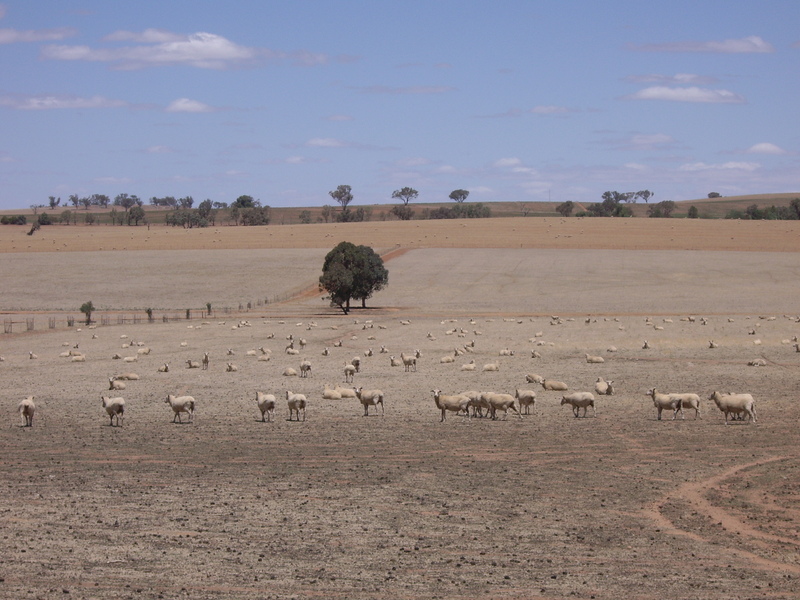 Drought, however has forced us to reduce our cattle numbers to a more manageable number; so we now run less than a quarter of what we once did. This led me to being thankful that we still have some stock. There are many north, west and south-west of us who have either completely de-stocked or are still struggling on with the daily grind of hand feeding. Hello out there … anyone? Yes, the drought continues … just in case you were wondering. Some are entering their fourth year of this relentless drought. Of no income. Of increasing debt. Of lack of political clout to influence change. Many are waiting for enough rain to produce a green tinge which might make the ‘for sale’ photos look better, others are simply cutting their losses and walking away. Some are digging in, cutting costs and reducing spending to less than the bare essentials whilst others are surviving on donations from those who still believe in the future of Australian farmers. Meanwhile the businesses in small rural communities continue to receive NO assistance at all. Governments have removed any reference to the word “disaster” that was once attached to drought and created new policies around “drier than normal conditions” that we are to be prepared for. Fair enough, but give us the wherewithal to do that and a timeline to work towards before leaving us high and dry (excuse the pun). Will history reflect that misguided and ill-timed policies, with no fall-back position, were the catalyst that broke an industry once considered the backbone of the nation? 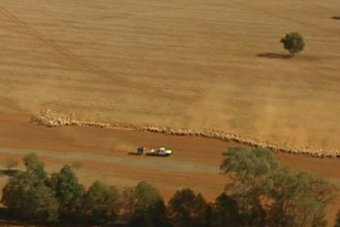 As with all things in the media, stories are here today and gone tomorrow, but drought still rages unabated in some areas and the rain that fell in the north-west of the state at the end of March was patchy at best. In our house gauge we received around 110mls but across the road (maybe 2/3klms) we had 130+mls with twice that further east in places and less than half, only 10klms west. Travelling home from a wedding in Dubbo, when we couldn’t traverse dirt roads because they were too wet, the dust was still flying between Coonamble and Walgett. Whilst we have been provided with some respite from the constant, daily grind of feeding, others are still faced with sourcing feed at huge expense and delivering it to starving animals. Many have de-stocked, others have been able to find agistment which provides relief from the endless and monotonous routine, but not for the bank balance. The rain we received, whilst adequate to produce some feed, is about a third of what we will need to produce a crop and without more rain VERY soon the window will also close, for another year, on income from that source. Some might say at least we are a third of the way in front of those croppers who have had no rain and they would be right, to a degree. As the weeds sprang to life in our cultivations and the boys launched into spraying (to conserve the valuable moisture) I commented on the irony of it all when only a week or so before we had been depressed at the constantly desolate and dry outlook. This euphoric state and renewed optimism was not to last though and we had to call a halt to the spray regime because the ground was so dry that the moisture virtually sank out of sight and chemicals were no longer required to dispatch those sweet green shoots. Those who did not receive rain can be assured that constant feelings of guilt have pervaded my lifted spirits knowing that you have not had this all too brief change from dust bowl to feed bowl, as you look out your kitchen window. I can only hope some of you benefited from a share of the donation CWA of NSW forwarded to the Rural Financial Counselling Services to be distributed to drought affected families across the state earlier this year. I wish it could have been more because my understanding is that successful applications, for some government assistance measures, have been few and far between.